Not long ago we took Das Keyboard’s latest devices out for a spin: the long awaited Das Keyboard 5Q and X50Q. Our experiences with both keyboards were mostly positive, primarily due to their sturdy construction and tactile switches. However, high quality materials and switches are nothing new for Das. But when you've been building sturdy mechanical keyboards for years and have gone through various iterations of the same board to get it near perfection for your intended market, how else can you innovate? The Das Keyboard 5Q and X50Q introduced the concept of the “cloud connected” keyboard by streaming information from the web directly to your fingertips. As interesting as the idea is, I found that the way it was implemented was a bit gimmicky and impractical for the average user. Das is hoping to improve upon what we saw before, offering the same cloud features we tested last September, while adding smart IoT device control. These new software features have been made available to the 5Q, X50Q, and now on their latest 4Q model. 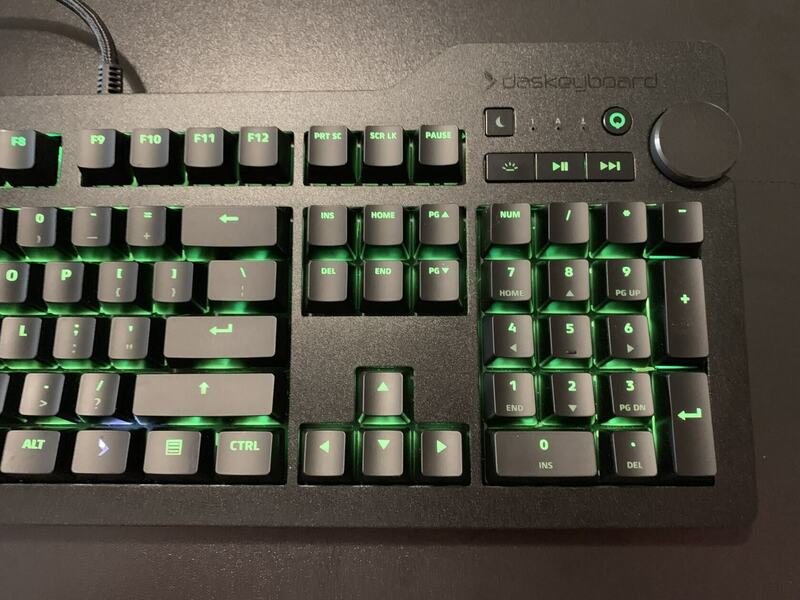 The Das Keyboard 4Q, as the name implies, combines the proven hardware design of the Das Keyboard 4 we know and love, while adding the smarts of the 5Q as well as per-key RGB backlighting. Are the new IoT features useful enough to make the 4Q a better buy than the 5Q or even the standard Das 4? Let’s find out. 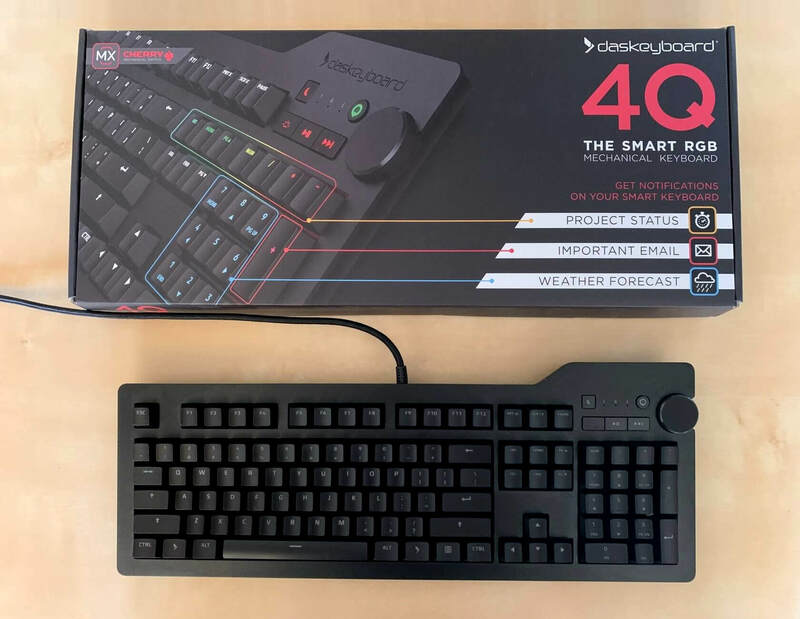 If you’ve already read my review of the 5Q and X50Q, or if you’re simply a fan of Das Keyboard’s devices in general, it won't come as a surprise for me to say the 4Q is one of the sturdiest keyboards I've ever used. It's right up there with any other high-end keyboard, and it's definitely on par with the 5Q and X50Q. Just like those devices, the 4Q has a solid aluminum top plate and firm plastic backing. Neither surface scratches easily, and the keyboard as a whole did not warp or bend even when I applied intense pressure. From a design perspective, there are a few key differences between the 4Q and the 5Q or X50Q. Namely, the 4Q does away with the two-in-one Q button/volume wheel system. Now, there’s a new dedicated Q button directly adjacent to the volume wheel. This is a small change, but it solves the problem of accidentally opening up the Q software when you only meant to adjust your system’s volume. A few features inherited from the standard Das 4 Professional, we see the inclusion of the “sleep” key, which puts the 4Q into a power-saving mode until you use it again. It also comes with a USB 2.0 hub with two ports towards the rear of the device. I didn’t find myself using them all that often, but I can see them being a lifesaver for those with more peripherals and gadgets than I. With the good and neutral changes out of the way, let's talk about some of the things I didn't like about the 4Q's design. First, unlike the 5Q and the X50Q, the 4Q does not ship with a wrist rest. Instead, you get an awkward stand-off bar (called a "footbar" by Das) that attaches to the bottom of the keyboard, presumably intended to improve ergonomics. Unfortunately, it doesn’t serve that purpose very well, and that leads me to my second complaint: the keyboard is slightly uncomfortable to use. Even with the stand-off bar, the 4Q lies almost completely flat, which forces me to tilt my hands upwards at an uncomfortable angle to type or game. A final design-related difference compared to the 5Q and X50Q, there were two accent lights located on either side of the keyboards; they weren’t all that visible during the day, but at night they cast a soft glow across my desk which I tend to like. Das has eliminated those accent lights on the 4Q. 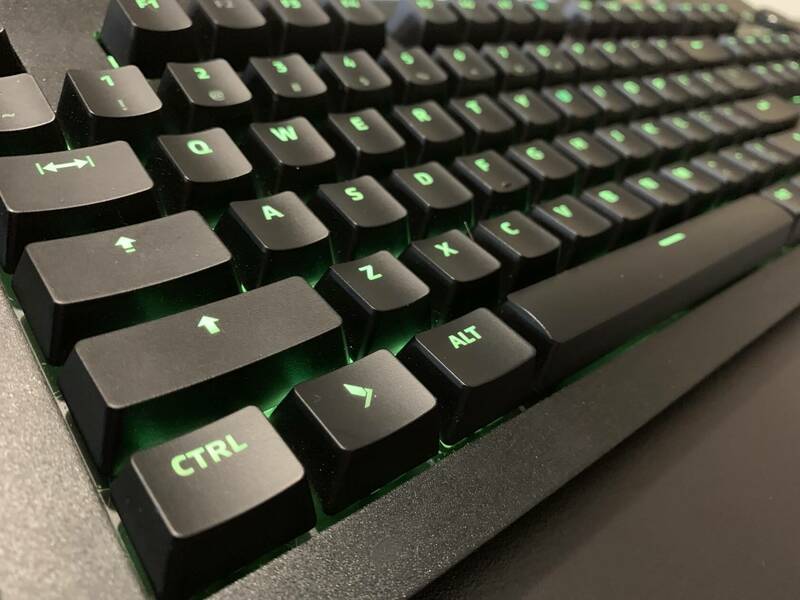 Moving on from general design, let’s talk about what is arguably the most important part of any good mechanical keyboard: the keys themselves. In this regard, I wasn’t disappointed. The keyboard feels fantastic to type on, but that’s really no surprise given the Cherry MX Brown switches that Das has included under the hood. Browns are generally considered the pleasant middle ground between Cherry’s softer (and quieter) MX Reds and clickier MX Blues. In the Das 4Q’s case, they manage to feel responsive and tactile without shattering your eardrums. While I hammered away at this article on the 4Q review unit, I found that my typing accuracy was just as good as it had been on the 5Q (my previous daily driver). 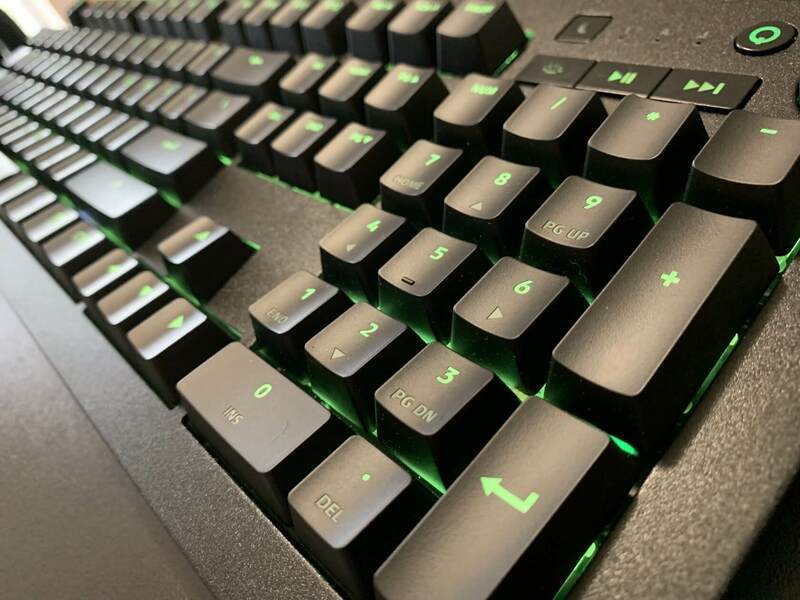 As an added bonus, the 4Q’s switches feature full per-key RGB backlighting, customizable through the "Q" software. 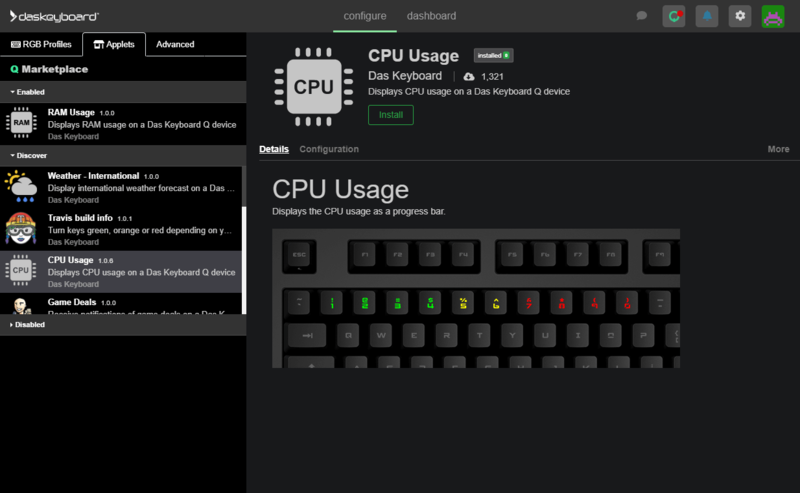 As mentioned before, Das is trying to innovate through software and it's making the Q software one of the main selling points of their cloud-connected keyboards. While we were writing this review we noticed Das had just released a January software update with improvements, there was another on December, so they're actively developing the platform. 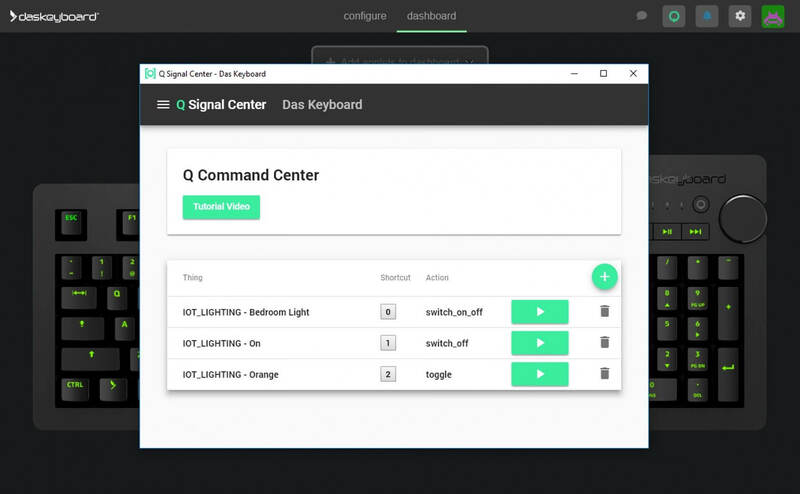 Signals are customizable in-keyboard alerts that use two third party services: IFTTT and Zapier. This lets you connect the 4Q with various apps (such as Discord and Slack) and websites (such as Twitch or YouTube). Once connected, you can set custom lighting effects for any given key, which will only trigger when a specific criteria is filled. For example, you can set your T key to flash purple when your favorite Twitch streamer goes live, or you can have your ESC key flash yellow when you receive a message on Slack. You could even tell your keyboard to remind you to keep up with your laundry every hour. 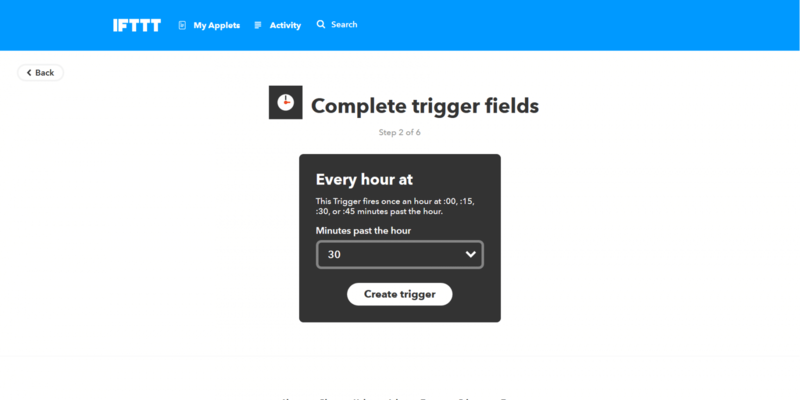 The Marketplace contains a few basic (free, despite its name) pre-set Signals that work on a plug-and-play basis - there’s very little set-up required, and you won’t have to sign up for IFTTT or Zapier to use them. You can set up Twitch notifications, periodic “stand up” reminders, or keep track of the temperature outside, among other things. These features sound great in theory, but in practice I personally didn’t find much of a use for them. Still, this is one aspect of the 4Q experience that is completely subjective, so it’s up to you to decide how much use you think you could get out of the device’s cloud features. The Das 4Q’s RGB lighting system isn’t much different than what you’ve probably seen from other mechanical keyboard manufacturers, on the upside, it is one key feature than previous Das Professional models lacked. To adjust the 4Q’s backlighting, all you have to do is click the “RGB Profiles” tab within the “Configure” section of the Q interface. 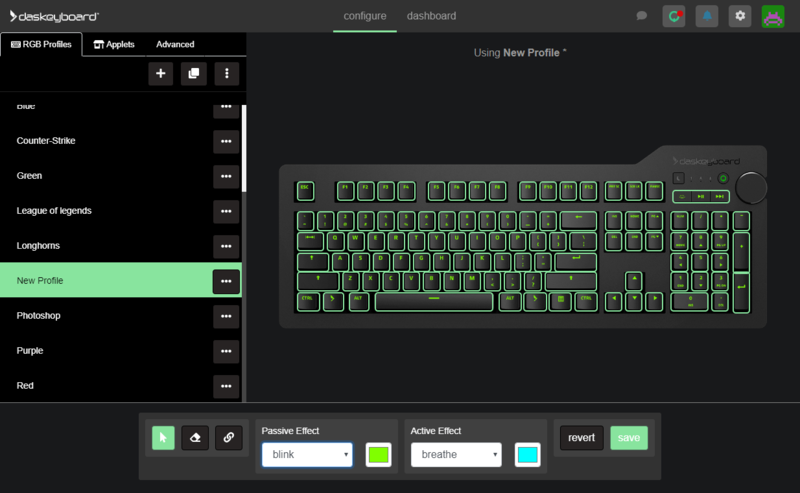 From there, you can create custom lighting profiles and add various effects to individual or groups of keys, such as breathing, rainbow, or ripple. Since I reviewed the Das 5Q, the IoT feature has been added, so I began my testing with high hopes. I don’t have many smart devices besides a few Philips Hue bulbs, but I still expected to see a wide variety of IoT device control options for other better-equipped users to take advantage of. Unfortunately, that wasn't the case. Though this may improve in the future, as of writing, you can either control your smart home bulbs to a limited degree, or you can adjust your smart thermostat - that’s it. There are no options to use your keyboard to control smart door locks, cameras, or any other fancy gadgets. Limited options aside, what IoT features the 4Q does have are fairly simple to setup. You just have to take a trip to the Q software’s Command Center, which is tucked within the Q Signal Center. Once you’ve done so, merely follow the on-screen prompts to set up a specific action, such as toggling on or off your bedroom light. If you get stuck, Das has published a helpful tutorial video, but the process is fairly straightforward - just know that you will need an IFTTT account to use these features. As mentioned before, the lighting control options are pretty limited at the moment. The only actions available to me were various on/off toggles for my lights. Despite several hours of experimentation, I found no way to use my 4Q to change my Hue bulbs’ color or adjust their brightness. The restrictive nature of the 4Q’s IoT features don’t end there. If you want to change something about an action (not that there’s much to change) after configuring it, you’ll need to delete it entirely on the Q software side and re-create it, because there’s no edit button. Furthermore, it doesn’t seem to be possible to change the shortcut key for an action; it defaults to 0 and increments up by 1 for every additional action you add. With the Das Keyboard 4Q, the company has completed a new series of luxury-oriented keyboards. Starting at $250 with the 5Q and $200 for either the gaming-oriented X50Q or the Das 4Q. Meanwhile, the previous models will continue to be sold at the same prices, which to be honest were considered pretty premium already: the Das 4 Professional / Ultimate, Model S and Prime 13. Putting build quality questions aside -- no problems whatsoever there, coming from the Das 5Q, I did miss the wrist rest and I felt the ergonomics of the 4Q are not as good, so that's something to consider. That, coupled with my already-established indifference toward the Signal system, leads me to feel that the 4Q just doesn’t offer enough unique functionality to be worth picking up over competing products. If you happen to feel differently about Signals and consider them a good feature to have, Das' X50Q is likely a better alternative. It has the same $200 price tag, but it ships with a couple of this keyboard’s missing features, such as a wrist rest, and accent lighting. Both the Das 5Q and X50Q ship with Gamma Zulu switches, while the 4Q and the rest of Das Keyboards use Cherry MX switches of the Brown or Blue variety, depending on the model. To be clear about differences, too, the Das 5Q and X50Q do not come with a USB hub, while the 4Q features a two-port USB 2.0 hub, and the older $150 Das 4 Professional comes with a two-port USB 3.0 hub. The downgrade in this instance is not at all welcome. The idea of adding notification capabilities to your keyboard is still new and it will take time for Das to determine the viability of more functionality. At the end of the day, the decision is up to you. Perhaps the idea of switching on and off your lights or adjusting your home’s temperature without having to deal with an app or a clumsy voice assistant is a major selling point for you -- or maybe you're just in the market for a solid keyboard, and don't particularly care about the extra features. On the latter case, Das delivers as always, though it remains an expensive affair for most.